These capsules are an excellent alternative to the pure liquid form that we typically use. They're especially handy when traveling or on the go. As is the case with the pure liquid form, these gel capsules contain cod liver oil that comes from deep, unpolluted waters near Norway. A small amount of natural vitamin E is included to help preserve freshness of the delicate long chain omega-3 fatty acids. Carlson cod liver oil is regularly tested using AOAC international protocols for freshness, potency and purity by an independent, FDA-registered laboratory and has been determined to be fresh, fully potent, and free of detrimental levels of mercury, cadmium, lead, PCB's and 28 other contaminants. A strong and healthy cardiovascular system, particularly a healthy heartbeat and clean blood circulation. A healthy brain and nervous system, especially important if you suffer from depression or other emotional disorders. A balanced and strong immune system. Healthy joints, particularly helpful if you suffer with arthritis. Healthy skin and mucosal linings, including the lining of your digestive tract. Why should you consider making cod liver oil a permanent part of your healthy food plan? It is one of the most reliable and concentrated food sources of four nutrients that are essential to your health: DHA, EPA, vitamin A, and vitamin D.
DHA is a fatty acid that is essential to the health of your nervous system and eyes. It is vital to preventing depression. If you suffer from intermittent or chronic depression, this is one nutrient that you want to get every single day. If you want to get pregnant or are pregnant, you need to eat foods with DHA on a regular basis in order to support proper development of your baby's nervous system and prevent depression during pregnancy and after the baby arrives. EPA is a fatty acid that promotes a healthy cardiovascular system and decreases inflammation throughout your body. Its anti-inflammatory properties makes EPA especially helpful to people who suffer with arthritis. EPA is also closely linked with your emotional health, with many studies showing that it plays a strong role in preventing depression. Vitamin A is necessary for proper vision, healthy skin, and strong mucosal linings, including the lining of your digestive tract. Many skin and digestive disorders cannot fully heal without a reliable supply of vitamin A.
Vitamin D is essential to maintaining strong bones and teeth. It enhances the strength and efficiency of your immune system, which decreases your risk of developing autoimmune conditions. Vitamin D helps your body regulate its blood sugar levels, playing an important role in preventing type II diabetes. Finally, vitamin D is one of several nutrients that are necessary for preventing high blood pressure. 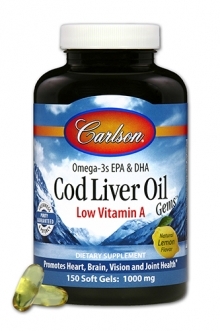 For the past twenty-five years, Carlson has been providing exceptionally high quality cod liver oil by using only cod that are harvested from clean arctic waters off the coast of northern Norway. These cold ocean waters contain the ideal nutrients for the growth of healthy cod, rich in the nutrients mentioned above. During the fishing season, cod are gathered and brought to the fishery everyday, where workers immediately remove the liver oil from the liver tissues. Many other types of cod liver oil are not made on a daily basis because they come from cod that are caught by large boats which are out on the ocean for 1-2 weeks, making it impossible to make as fresh a product. This is an important point, as the freshness and nutritional content of cod liver oil depends largely on how quickly the oil is removed from the liver tissue. Carlson uses a special steam extraction process that produces a super high quality oil that doesn't have a bad taste or smell like some other varieties. As soon as the oil is produced, it is put into 2.5 ton containers that have nitrogen pumped into them. Nitrogen is necessary to remove any oxygen in the containers, another important step that is taken to maximize freshness, as oxygen can damage the valuable fatty acids in cod liver oil. Please note that the gel capsules used in this product are bovine-derived. This is a wonderful way to take a very high quality fish oil. I have never tasted it at the time of taking it--or afterward, if you know what I mean! and do you sell it - I haven't seen it here.